Carbon pricing programs in the Oceania region have experienced major challenges as Australian federal officials successfully repealed the country’s carbon tax program while prices in New Zealand’s carbon trading program have been pressured by the influx of less expensive international units. The New South Wales (NSW) Greenhouse Gas Reduction Scheme (GGAS) was an Australian mandatory state-level program launched in January 2003 – two years before the European Union Emissions Trading System – to reduce greenhouse gas (GHG) emissions by electricity retailers and other parties in Australia’s most populous state through 2021. But in April 2012, the NSW Government announced the closing of the GGAS upon the start of the federal government’s carbon tax to reduce duplication between the federal and state programs and to minimize costs for electricity consumers, as directed by the GGAS legislation that required the state system to be wound down if a national carbon pricing mechanism were implemented. In July 2012, the Australia federal government introduced a carbon tax requiring businesses emitting more than 25,000 tonnes of carbon dioxide equivalent (tCO2e) emissions annually to purchase emissions permits. These entities accounted for about 60% of the country’s carbon pollution. The carbon price was initially set at AU$23/tCO2e for the 2012–2013 financial year, but rising by 2.5% a year until a transition to an emissions trading program in 2015–2016. In 2014, the Liberal Party of Australia, led by Prime Minister Tony Abbott, replaced the carbon tax with an Emissions Reduction Fund (ERF) designed to maintain the objective of helping achieve Australia’s emissions reduction target of 5% below 2000 levels by 2020. The government has provided nearly AU$2.6 billion over four years to establish the ERF and buy offsets from competing sellers in a reverse auction. The first ERF auction occurred in April 2015, with the government awarding 107 contracts to 144 projects for more than 47 million tonnes of emissions reductions. The auction generated an average price of nearly AU$14/tCO2e, with the combined value of these contracts surpassing AU$660 million, according to the Clean Energy Regulator. Carbon offsets can be generated from ERF-eligible projects in the agriculture, forestry, building, and other sectors. The New Zealand Emissions Trading Scheme (NZ ETS) was implemented to allow the country to do its “fair share in tackling global climate change” and to help New Zealand meet its international obligations to reduce its GHG emissions under the United Nations Framework Convention on Climate Change and the Kyoto Protocol. The scheme covers emissions of the following six GHGs: carbon dioxide, methane, nitrous oxide, hydrofluorocarbons, perfluorocarbons, and sulfur hexafluoride, which are covered by the Kyoto Protocol. Under the NZ ETS, the forestry, transport fuels, electricity production, industrial processes, synthetic gases, agriculture, and waste industries have compliance obligations. Participants from the forestry sector are required to surrender one New Zealand unit (NZU) – the primary unit of trade in the NZ ETS –for each tonne of GHG emissions they produce, while participants from non-forestry sectors are required to surrender only one NZU for every two tonnes of GHG emissions. Kyoto Protocol offsets were eligible for compliance in New Zealand’s ETS, but these international offsets are no longer eligible as of the end of May 2015 since the country did not agree to the protocol’s second commitment period. The NZ ETS still allows the use of domestic offsets generated from the forestry sector, although there are limitations on which forests can participate in the program. New Zealand must account for any deforestation of pre-1990 forests (both indigenous and exotic), but not of post-1989 forests as part of its Kyoto Protocol obligations. Post-1989 land-rights holders have the option to voluntarily participate and earn units for sequestration in return for assuming liabilities for future reversals, according to New Zealand: An Emissions Trading Case Study. On the other hand, people with rights to pre-1990 forests incur mandatory obligations for emissions if they deforest their land, which requires coverage with emissions permits, according to the case study. The Permanent Forest Sink Initiative (PFSI) enables landowners to receive Kyoto compliant Assigned Amount Units for sequestration in return for a covenant on future land use. The design of the PFSI differs from the NZ ETS in how it manages the risk of non-permanence, the case study noted. The PFSI requires the establishment of permanent forest with restrictions on harvesting for a period of 99 years. Conversely, the NZ ETS makes the forest owner liable for carbon losses. After suffering from a series of policy setbacks, Oceania project developers struggle to find voluntary demand in the region. 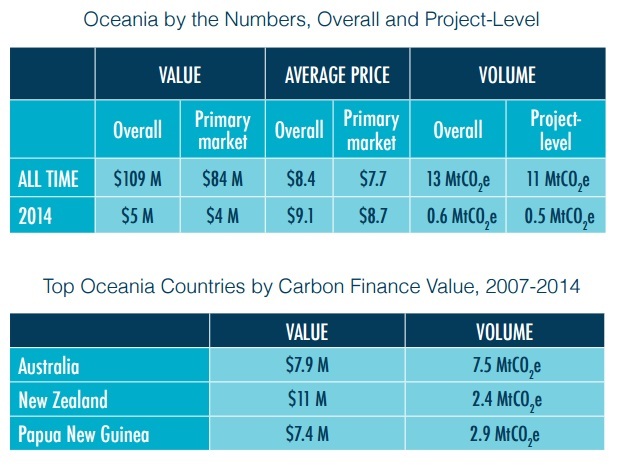 This year the reported overall volume – 0.6 million tonnes of carbon dioxide equivalent (MtCO2e) – was the lowest of all regions, and Oceania also gave up last year’s title of highest average price to Europe as this year’s average fell 56% to $9.1 per tonne, according to Ecosystem Marketplace’s State of the Voluntary Carbon Markets 2015 report. In Australia, the Liberal Party held true to its promise to repeal the country’s carbon tax. The compliance program ended in 2014, replaced with an Emissions Reduction Fund (ERF) set to provide AU$2.6 billion in government finance to purchase offsets in a reverse auction. Yet project developers were left wondering exactly what that meant in terms of price and project selection. Due to the uncertainty, market activity remained lackluster last year, with Australian respondents transacting the second-lowest price on record for the region, $10.4/tCO2e, and increasing volume only by 3%. Some project developers expect the voluntary market to grow this year, since some businesses no longer under the carbon tax may elect to offset voluntarily. Nearby New Zealand also reported muted figures. Though the volume increased from last year, it still remained below 0.01 MtCO2e and prices reached an all-time low of $4.1/tCO2e. There, the government is working through its own compliance market issues, namely that the acceptance of international offsets such as Emissions Reduction Units (ERUs) have pressured New Zealand Unit (NZU) prices and displaced demand for local projects. As of mid- 2015, the former will be restricted and anticipation of only NZU offsets in the compliance program has already caused some NZU prices to increase since late 2014. If that trend continues, voluntary market prices may also rise in the coming year.